After over a year in the planning, on Thursday 21st February cadets from all over the UK started to descend on Crickhowell Training Centre, the home of Gwent & Powys ACF for the musical training weekend which ends with the annual Rorke’s Drift Concert. For the first time in the 16 year concert history cadets from Christ’s Hospital CCF joined the other cadets from Hampshire, Lincolnshire & The Royal County of Berkshire to dazzle the local audience and gathered guests including Mayors of 7 towns, HM Lord Lieutenant and Welsh members of Parliament. This music camp has been run on behalf of Gwent & Powys ACF for the past 15 years by WO2 Band Sergeant Major Adrian Beckett MBE, a former Welsh Guards musician and now Coldstream Guards Band Sergeant Major, and is the most exciting and popular of all musical activities in the ACF. "This year will be more special than nearly all the others put together", Adrian says. "This year Corporal Johnson Beharry VC, the Patron of ACF Outreach will visit the cadets and attend the concert". "There are two days of intense musical training in the lead up to a sell out concert. Tickets have not been available since mid January, and I am aware of parents travelling to support the concert from as far away as Scotland, Lincolnshire, Hampshire & Cumbria just to be apart of this great event". "This is the concert all musicians in the ACF want to attend as it extends all their training and rehearsal into the public eye which is so necessary and exciting for any young person". Corporal Beharry presented the Fred Smith Award, an award set up in the name of a young cadet whose father sadly passed away. "Corporal Beharry was inspirational, he spent a huge amount of time speaking with the cadets and having endless photographs taken" WO2 Beckett declares. "We know him in the military for his heroism and whilst the cadets know his story, I can’t help thinking they also feel as if they know him due to the Dancing on Ice TV show". Cadet Tammy Mohamed, a 13 year old Cadet, from the Nottinghamshire ACF Band, has been in the Cadet movement for less than a year. At the time of the Concert she had only been in the Band for 1 month. She was selected to play a Flugal Horn Solo at the concert. Andrew Lloyd Webber’s sensational hit from Whistle Down the Wind ‘No Matter What’ was selected. Tammy said: "I’m nervous" but she just carried it off so professionally, she put some of the Adults to shame! 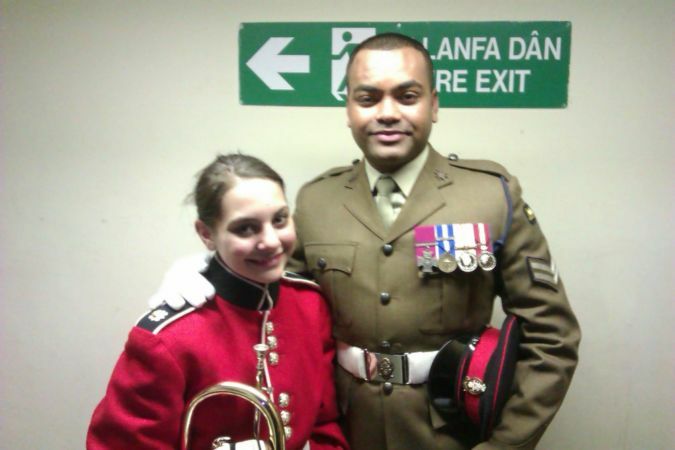 "Iit is an honour to be able to support people like Corporal Beharry, through music.". Having played her solo Tammy continued: "That was fantastic I really enjoyed being part of the Concert, I can’t believe I have just been on stage playing a solo with over 120 other musicians, can I do it again?" Next year's music camp is being held over the weekend of 22rd February and is already nearly fully booked. 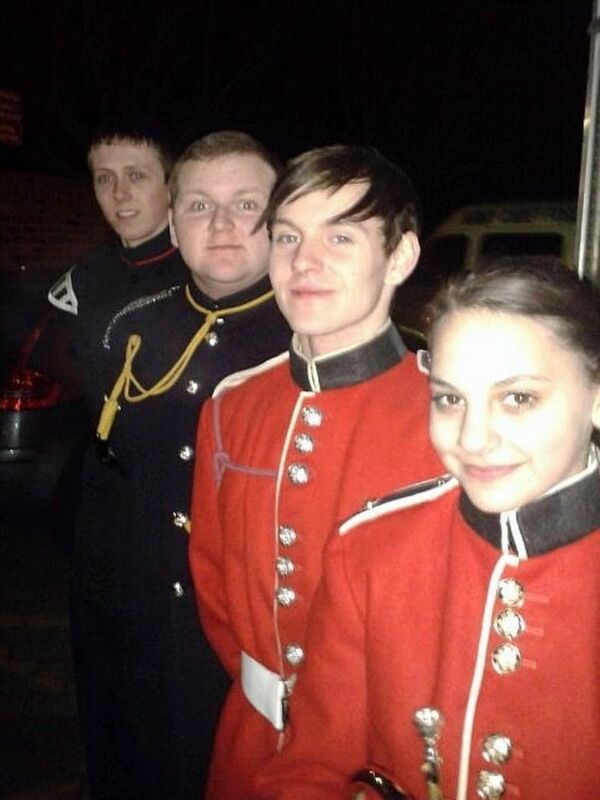 But why not read what the cadets have to say, they after all are the stars of the show! "The 16th Annual Rorke’s Drift Concert, was by far, the best I have ever taken part in. Both the music and the atmosphere were outstanding. In the 5 years I have been a part of the Rorke’s Drift experience, none has run so smoothly and for me, been so successful as this year's has. It has been the most exciting and the most memorable Rorke’s Drift concert of all time. I am so proud of everyone who took part, can't wait for next year's show stopping concert". "Being in an infantry contingent I am not used to performing with Cadet Bands, and it was a very different experience to what I do in my civilian band. Playing alongside musicians from all over the United Kingdom, and being given the opportunity to play a solo in I Dreamed a Dream, is an experience I will never forget". "Last year I performed a flute solo in Brecon called Hora Staccato, and since then my life has changed dramatically. I am now currently studying Flute and Piccolo at the Royal Military School of Music in Twickenham to become an Army Musician. I am hoping to be posted to the Band of the Scots Guards. Like all soldiers musicians must complete 14 weeks basic training, which had its ups and downs, but it was mostly good times as everyone was feeling the same. It is hard but highly rewarding. Kneller Hall is excellent, the fun and friends you have is unreal. I would recommend joining the Corps of Army Music to anyone as it’s a brilliant career. Just getting through basic training is the hard bit but isn't too hard. I loved being able to visit The Rorke’s Drift Concert again and encourage some of the younger members of the Cadet Force in their performance. I felt it was even better this year than the previous year. It was so exciting for me travelling from London down to Wales. The rehearsals were extremely good and it was all great fun. Once again the concert is at the forefront of ACF music training using regular musicians alongside TA and CFAVs". Musician Adam Higginson, formerly 1st Battalion NI Corps of Drums. "Rorke's Drift 2013 was a very enjoyable event and it was my third Rorke’s Drift Concert. We played some amazing music, like Adele in Concert, Toccata in D Minor and a tribute to one of the best Welsh singers, A Shirley Bassey Showcase plus many more. I would recommend it to the public, go and watch it next year because it is very worthwhile and a great show with an excellent host called Adrian Beckett who is very funny and a class comedian!" "2013, My first Rorke’s Drift Concert and what an experience it was! Having the chance to perform ‘Fly Away’ in memory of Toby, my best friend who passed away in his sleep, accompanied by a full Military Band is something I will never forget. Aside from the performing to a sold out audience in Theatr Brycheiniog, I had a great experience with some great friends and even made lots of new friends. The Rorke’s Drift Concert allowed me to show the ACF the non-green RSM side of me! Thank you Adrian and the Gang!"